Well, this year's LEGO offering has been good time me. As a starter... 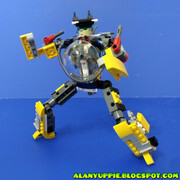 I immediately took a liking to LEGO Creator 31090 due to the prospect of building a LEGO TF from the parts inside. So here we are. BumbleSea is a low profile sibling of Bumblebee and he transform into an undersea sub with salvage and recovery abilities . Transformation doesn't require reassembly of parts.